The Prop Den • How long did it take for you to get a T*E? How long did it take for you to get a T*E? Post subject: Re: How long did it take for you to get a T*E? What I would do is give him a deadline. He's had a reasonable amount of time and there's no excuse for a wait that long or he should not have taken your money until it was ready to send. Give him one month or your money back and if he doesn't comply then take action. Matt doesn't give refunds, you should know better than that. I don't care to know him. Message subject: Re: How long did it take for you to get a T*E? Subject: How long did it take for you to get a T*E? Not the best idea. Now a staff matter. I got my HDPE in within a month, bought through one of the FISD thread. Abit of a delay, TE communicated with me and explained the delay. And the item came through for me as promised. Wish the rest of you guys gets yours soon. Did you get yours, Mac? Seems like someone got his before you. I got an email from Matt saying my HDPE lid had shipped Matt explained the delays to me. Hopefully this is a sign that things are getting back on track for Matt I know he has been having a rough patch lately. I hope yours is on its way soon Mac. Thanks for asking. I received mine last week but forgot to update the thread. So ends a year-long wait. Did TE get banned for sending nastygrams or was it something else? User T*E has been banned for harassing other members. He already received his formal warning and a suspension, and since we use a three step system, the next step was a ban. As a reminder, there is no excuse for behavior like that. Personal attacks are not allowed. oops, my bad. didn't see that. Hey Mac, how do you like the helmet? Any pics ?? To help facilitate T*E's challenges, I asked for my order in kit form instead of fully finished as was the initial order. 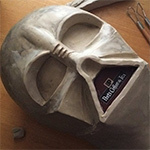 Haven't begun work on it yet; T*E shipped it directly to a friend of mine who is allegedly a better painter than I am, and who has a bit more study with stormtroopers under his belt. So I haven't seen it personally. Everyone, thanks for your moral support these past several months. I really wish T*E didn't get himself banned. There is so much he could have contributed. Aside from BS laced vitriol? Let me know when you get it. I would like that check it out.